Posted on 3, October 2016 by EuropaWire PR Editors | This entry was posted in Automotive, Marketing, United Kingdom and tagged Rolls-Royce Motor Cars, Rolls-Royce Motor Cars Studio, Torsten Müller-Ötvös, ‘Car Gallery’. Bookmark the permalink. INCHEON, South Korea, 03-Oct-2016 — /EuropaWire/ — Torsten Müller-Ötvös, Chief Executive Officer of Rolls-Royce Motor Cars, today opened the new Rolls-Royce Motor Cars Studio in South Korea, only the second permanent Studio for the marque worldwide after the ‘Atelier’ at the Home of Rolls-Royce Motor Cars in Goodwood, England. The new Rolls-Royce Motor Cars Studio, which opens on 1 November, is the first of its kind in Asia and the only Rolls-Royce facility in the world to offer closed-course test drives. As a unique brand experience centre, it will offer guests an insight into the world of the iconic marque in a relaxed atmosphere in the most effortless of manners. Located close to Incheon International Airport, the 200 m2 space is divided into two intimate sections. 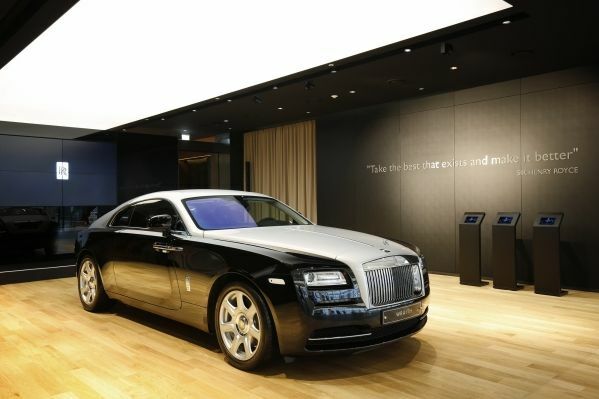 Visitors are first greeted by the ‘Car Gallery’, showcasing the latest Rolls-Royce models on a rotating basis. In the adjoining ‘Atelier’ lounge, visitors can explore the world of Rolls‑Royce Bespoke on an appointment basis. The ‘Atelier’ cossets guests in luxury surroundings reminiscent of Goodwood, bringing a flavour of the Home of Rolls-Royce to South Korea. Displays allow visitors to appreciate first-hand the depth of luxurious detailing that goes into crafting a Rolls-Royce and the wealth of Bespoke possitibilities offered, with an extensive range of examples of the wood, leather, paint and features available for their motor car. They will even be able to commission a Bespoke Rolls-Royce should they wish. Guests will also have the opportunity to drive a variety of Rolls-Royce models on the facility’s 2.6 km closed circuit and surrounding roads. Instructors trained by the Rolls-Royce driving academy in Goodwood will offer bespoke experiences on the best way to ride in or drive a Rolls-Royce, bringing to life the legendary Magic Carpet Ride and helping discerning individuals understand the phenomenal and uniquely luxurious capabilities of a technically state-of-the-art Rolls-Royce. The Rolls-Royce Studio concept began in 2013 with the Rolls-Royce Studio in Cannes on the Cote d’Azur. In summer 2014 Rolls-Royce Motor Cars launched a second ‘Summer Studio’ at the exclusive enclave of Porto Cervo on the Costa Smeralda in Sardinia, Italy. The Porto Cervo Summer Studio this year marked its third year welcoming patrons from around the world. All Studios are united by the fact that they are more akin to a club or lounge than a traditional dealership environment.